Dr. Adam Hauser (center) and two students work on the ADAM system, one of many shared deposition systems in the MINT Center. The Department of Physics and Astronomy offers programs leading to the master of science and the doctor of philosophy degrees. Graduate Advising Committee: Dr. Dean Townsley, Dr. Paulo Araujo, Dr. Conor Henderson, Dr. Preethi Nair, and Dr. Sanjoy Sarker. Observational and theoretical astronomy research programs include galaxy interactions and morphology, active galaxies and quasars, galaxy and gas dynamics in clusters of galaxies, and the cosmological distance scale. Faculty and students use the national observatories, the Hubble Space Telescope, and various satellites to collect data. Experimental and theoretical condensed matter includes cutting edge interdisciplinary research at the Center for Materials for Information Technology (MINT), a National Science Foundation Materials Research Science and Engineering Center. Research at the MINT center focuses on nanometer scale science and technology, on magnetic materials and devices for information storage. This includes spin electronics, novel strategies for information storage, and on the theoretical and experimental study of the electronic and magnetic properties of novel materials. 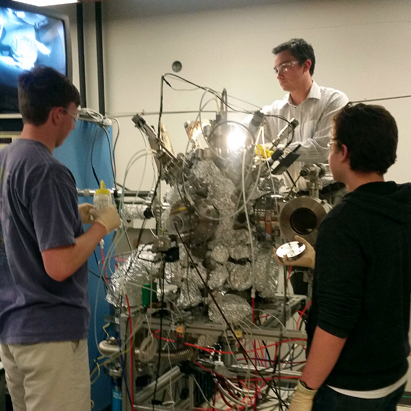 Other theoretical programs include high-Tc superconductivity and molecular spectroscopy. Theoretical high-energy physics research includes noncommutative geometry, field theory, quantum black holes, and the phenomenology of supersymmetry. Experimental high-energy research activities center on neutrino properties, on high energy astroparticle physics, and on instrumentation for particle physics experiments. More information about our research programs is available in our Research Overview.